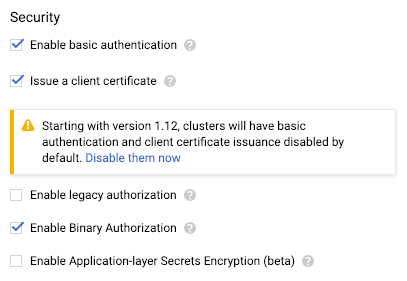 This page explains how to create a cluster in Google Kubernetes Engine (GKE) with Binary Authorization enabled. You perform this step at the command line using gcloud commands or in Google Cloud Platform Console. This step is part of setting up Binary Authorization. where PROJECT_ID is the ID of the project where you want to create the cluster. Open the GKE page in GCP Console. Click Create Cluster. Enter values for the default fields as described in Creating a Cluster. It can take a few minutes for your cluster to be created.